Successfully Added WIFI Network Adapter Card - Wireless Roaming + Extended Range to your Shopping Cart. 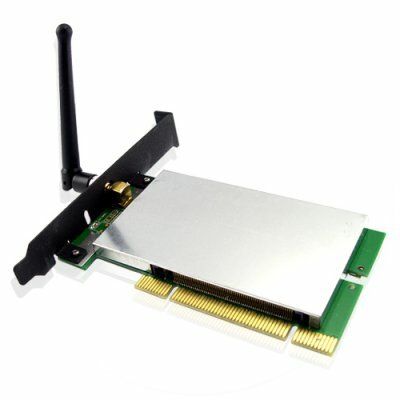 This Wireless 802.11G Wifi Network Adapter Card is a great way to connect to the world of wireless networking, with its extended range and wireless roaming. It can be used in Ad-Hoc mode to connect directly with other cards for peer-to-file sharing or in infrastructure mode to connect with a wireless access point or router for access to the internet your office or home net work. In either mode, your wireless communications will be well protected by its industrial - strength WPA and other security modes. A great product to retrofit into any older computer - get in the fastlane with the CVATX-WPCI01 by Chinavasion!